Having gone beyond our prime objective of survival, post-partition, we have reached the stage where the need of the hour is introspection and reflection on the necessity of preserving our traditions and values by reinforcing our identity with our rich and glorious past. Friends, the traumatic tragedy of 9-11 has affected everyone. It has made nations realize that now is not the time to sit back or be passive or just complain, but to act. So must it be with us Sindhis. 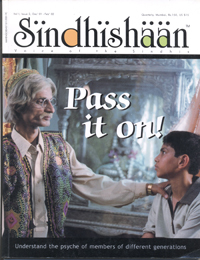 SINDHIAT – dead and gone! NO – We cannot and will never let that happen. Somehow, the chord seems to have been struck. Thanks to the sustained efforts of my Sindhi peers and brethren over a period of time – ‘SINDHIAT’ is slowly emerging from the shadows. The rich Sindhi heritage and culture will not fade away into oblivion. The dormant and then simmering quest for identity had begun to surface, and its sheer exhilaration to observe the younger generation’s enhanced involvement and participation. The timing seems just right to make the final concentrated effort in unison. Lastly, one small secret that I wish to share with all of you. Three months back my wife Shalini remarked, “Practice what you preach, your mind is full of SINDHISHAAN but do people know you can’t read or write Sindhi.” I must confess that although I am quite fluent with the spoken word, having been born brought up and educated in Mumbai I never regarded the lack of ability to read and write Sindhi as a handicap. Although I spoke in Sindhi with my grandparents, parents and other elders, my communication with my children was restricted to English or Hindi. Now Shalini’s remark really had me thinking, She, being a non-Sindhi conversed in fluent Sindhi with my parents and grandparents and I, being a Sindhi couldn’t read or write in my mother tongue.